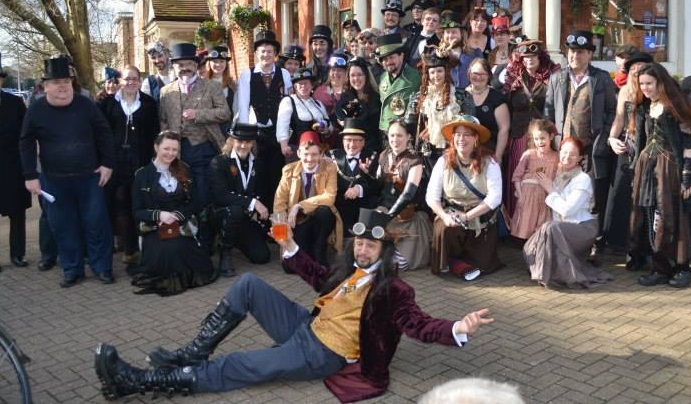 Yesterday I played a solo set at the Third Annual Surrey Steampunk Convivial – and it were bloody good fun. The event was organised by the lovely, quite mad Ben Henderson, of the band Moth. It included a Hat Stacking world record attempt, shadow puppets, corset limbo, a recreation of the battle of Waterloo and, of course, snail races. Lots of fun, well worth attending if you’re in Surrey next February. I played the whole of the Miser’s Will, something I’ve done live only a couple of times – material I am rather proud of. Even more pleasantly, there were actually people in the audience who knew some of my songs. Not many, but some. Probably the last solo gig or a while, as I’m busy elsewhere for much of the year. However, there will be plenty of recorded music over the next year, and hopefully some online gigs.